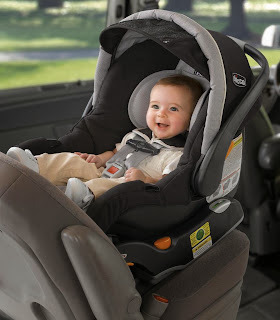 Today is the final day of Baby Safety Month, and I’d like to take this opportunity to share some car seat safety tips with you from Julie Prom, Car Seat Safety Advocate for Chicco. Making sure that your child is properly secured in the car seat that is correct for their size is extremely important should I car accident occur. Even if you think you know everything there is to know about car seat safety, I urge you to read over these tips and share them with your friends and family. The American Academy of Pediatrics and the National Highway Traffic Safety Administration recommend rear-facing as long as possible. Parents should keep child rear-facing until at least 2 years old, longer if the car safety seat weight and height limit allows. Young children are fragile and are best protected in a rear-facing car seat. To ensure a child can stay rear-facing as long as possible, purchase a convertible seat when your baby outgrows the infant seat. Air Bags and Children Don’t Mix – NEVER place a rear-facing car seat in the front an active frontal air bag, serious injury or death can occur. Back Seat is Best – The back seat is safest for all children. Keep children in the back seat until at least age 13. A car seat must be installed tightly in the vehicle to do its job. If you can move the seat at the belt path more than an inch side to side or front to back, it’s not tight enough. Forward-facing – A Tether is Always Better! – Always use the tether when using a forward-facing car seat. A tether will help hold the top of the car seat back and provide better protection for the child. Rear-facing – Keep baby’s Airway Open – Make sure a rear-facing car seat is at the correct angle so your infant’s head does not fall forward. Harness Height – Rear-facing, harness should be at or BELOW the child’s shoulders. Forward-facing, harness should be at or ABOVE the child’s shoulders. Harness Snug – Make sure the harness is snug! There should be no slack in the harness at the baby’s shoulders. Avoid bulky clothing; this can interfere with harness fit. Booster Seats – Ensure the adult safety belt is threaded properly through the belt guides. The lap belt should be on child’s lower hips/upper thighs and the shoulder belt should lay flat across the middle of the child’s shoulder and chest. Less than one third (31 percent) of parents are following manufacturer’s safety guidelines when deciding when to transition their child’s car seat from rear- to forward-facing. Car seat safety experts recommend parents keep their children rear-facing as long as possible and transition to forward-facing only when their car seat manufacturer’s guidelines are met. However, nearly half of parents (49 percent) are choosing to turn their child’s car seat based on comfort, rather than safety. Top reasons parents transition their child’s car seat from rear- to forward-facing are because their child’s feet were touching the vehicle seat (31 percent), followed by their child being too uncomfortable (10 percent) or fussy (8 percent) when rear-facing. Despite widespread understanding that children in car seats should remain rear-facing as longs as possible, a whopping 58 percent of parents underestimate the age at which it is safe to turn their child’s car seat to the forward- facing position. One-in-five (19 percent) parents say it was difficult installing a convertible car seat, yet parents are 40 percent less likely to get professional help installing a convertible car seat than an infant seat (15 percent vs. 25 percent, respectively). Please take some time before your next car ride to make sure your child’s car seat is the correct size and installed safely and correctly. If you are unsure of the installation click here to search for a car seat inspection station using your zip code or state. I wish more people cared about carseat safety. Thank you for posting this! You're welcome! It is so important! I know even I learn new things every day, and I've certainly learned a lot about car seats in the 3 years I've been a mom! Child safety comes first when travelling. These are really useful tips to follow. What a fantastic breakdown of car seat installation. Safety is top priority when it comes to your children. Traveling provides an entire list of obstacles for parents to maneuver around, and the car seat can be troublesome. Ensure that it is installed correctly, fits your child's age range, and is not expired. Thank you for your post. I hope many people who have never gone down a checklist like this will read your blog and find this post.